The Palisades Farmers Market, located between 48th Place and MacArthur Boulevard NW, is a producer-only market run completely by the community. Hundreds of tented merchants sell produce and other goods at farmers markets around D.C.
Now that the weather is warm, make your shopping trip double as an outdoor adventure. From fresh baked goods to artisan meals, you can get more than just produce from local farmers at the District’s many markets that pop up as summer rolls around. From Foggy Bottom to the Vern, here are some of the best farmers markets and vendors to check out this season. Freshfarm Foggy Bottom can satisfy all your artisanal food cravings, from paella to handmade pasta. Conveniently located next to the Foggy Bottom Metro station, this farmers market is a no-brainer for students. The market’s 17 vendors opened for the season earlier this month. Zayt & Za’atar sells a variety of Middle Eastern specialties, highlighting their speciality za’atar, a classic Middle Eastern mixture of spices. Zayt & Za’atar’s booth cooks up mana’eesh, a type of flatbread, served with toppings like za’atar spices, cucumbers, tomatoes and labneh – a tangy and creamy Middle Eastern yogurt. Opt for a classic mana’eesh with olive oil and za’atar ($6) or go for the “Lebanese bride” topped with labneh, za’atar, tomatoes and mint ($8). Co-founder Johnny Dubbaneh said the sense of community at the market has been by far the most rewarding part of his two years at the market. The Freshfarm Foggy Bottom market is open now through Nov. 21 on Wednesdays from 3 to 7 p.m. 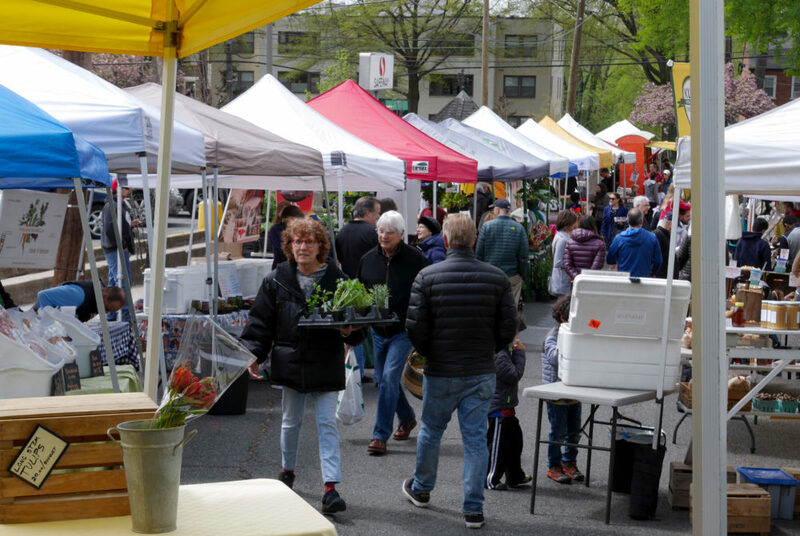 Located in the heart of the Palisades neighborhood between 48th Place and MacArthur Boulevard, within walking distance of the Mount Vernon Campus, the Palisades Farmers Market is a producer-only market run completely by the community. Founded in 2008 through a group of neighborhood volunteers, the market hosts more than 20 vendors and encourages visitors to stick around with live music from local artists, volunteer opportunities and a tent that hosts a different business or organization each week. If you’re not hungry but looking for tasteful decorations, Lynnvale Farms of Virginia sells custom flower bouquets made from flowers cut from their 10-acre farm. The arrangements go for $30 to $50, while flowers by-the-stem are offered for the thrifty aesthete. The spring season yields poppy and anemones, but the warmer weather will introduce peonies and sweet peas to the bouquets. Andrea Gagnon, who runs the company with her husband Lou Gagnon, said participants like Embassy employees, market regulars in their 80s and young couples of the area give a wide breadth of the neighborhood’s diversity. The Palisades Farmers Market is open year round on Sundays from 9 a.m. to 1 p.m. If you’re looking to get off campus for the weekend, venture to the Columbia Heights location of Community Foodworks, a nonprofit that manages 16 farmers markets in D.C. and Northern Virginia. The Columbia Heights market is in its eighth year of operation. The market hosts two lineups of vendors for both days of operation, Wednesdays and Saturdays. Saturday vendor Spriggs Delight, a family-run farm from Sharpsburg, Md., specializes in artisanal cheese made from goat’s milk. They sell containers of soft chevre in 5 ounce and 9 ounce containers for $7 and $11, respectively, or a tangy Greek-style feta for $8 to $10. Don’t miss dessert with hearty fudge for a dollar per ounce, and features flavors like chocolate mint, which melts in your mouth like a rich peppermint patty. John Littel, Spriggs Delight’s assistant manager, worked the market for a few years and said its location in the city sets it apart from their usual markets. “It’s in the nexus of a lot of different things,” he said, “Most of the other ones, there’s more families coming through, where that one is a bit more metropolitan,” Littel said. Community Foodworks offers incentives for shopping like the “Produce Plus” program, which gives $10 vouchers for local residents to buy produce at D.C. farmers markets. The farmers market also has a bonus bucks program that matches donations to serve low-income families, along with a summer meals program that provides snacks and meals to local children. Columbia Heights Farmers Market is open now on Saturdays from 9 a.m. to 1 p.m, and Wednesdays from 4 to 7 p.m beginning May 31.